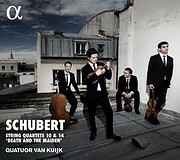 The new album from the Van Kuijk Quartet, released September 2018 on Alpha Classics, features recordings of Schubert's String Quartet No. 10 and No. 14 ("Death and the Maiden").